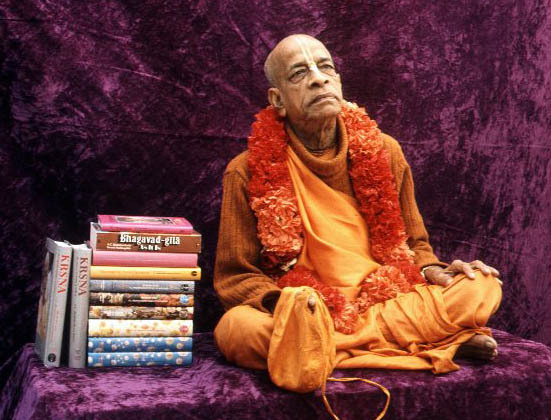 During Christmas, ISKCON temples around the world focus on book distribution. During the holidays people are out shopping in large numbers and are in a generous mood. So this time of year is the optimum time to distribute books. Maybe you are indirectly or directly involved with book distribution this year. If you are, I offer my obeisances at your feet for doing a service so dear to Srila Prabhupada. If you are not, I encourage you to get involved in someway, by either distributing books, buying books and giving them to friends and acquaintances, donating money so your temple or other devotees can distribute books, raising money to support book distribution, serving those who are distributing books, or in any other way you can think of. In order to inspire you in this service, I have taken an excerpt from an unfinished book I am writing (yet to be titled) about my life and experiences as a devotee. This book details my involvement with the movement from my first contact with devotees and includes the many things I have learned on the way, my encounters with Srila Prabhupada, and many untold histories of events in ISKCON. The following is a history of how big book distribution first began in ISKCON. It takes place in November of 1971 in Vancouver, Canada. This history is not recorded anywhere else. At this time there is no big book distribution in ISKCON. Although temples occasionally sell big books at the Sunday Feast, no one thinks it’s possible to sell big books on the street. We distribute Back to Godhead magazines for 25 cents, and although we have small books, we don’t bring them because we think they are too expensive to sell (we have to get 50 cents for them). I have never been one to be happy with the status quo (although sometimes that gets me into trouble) and I begin thinking that we should try to distribute the hardbound Krsna Books that have recently been published. This is such a big way of thinking that it’s difficult for any of us to take it seriously – myself included – since Krsna Books sell for $8 and we are scared to ask for 50 cents for a small book. Yet on Thanksgiving Day we decide to go door to door and bring Krsna Books along with our magazines. We figure it will be fun and exciting to show people the book and the pictures – and that alone will be our reward for our boldness. Of course, we know there might be a remote possibility of selling a Krsna Book, but we don’t expect it. Yet we are excited about trying to “shoot the rhinoceros.” So off we go. As we go house to house we feel blissful and enlivened showing the Krsna Book to everyone. After an hour we return to the van as planned. As the last devotee approaches he yells from a distance, “I had a major unforeseen accident.” We have no idea what he is talking about, but the huge smile on his face makes us suspect the impossible might have happened. “I just sold a Krsna Book!” he screams wildly. We’re in total shock. Our whole world turns upside down. We go crazy. We bang the walls of the van; we yell; we laugh. The impossible has just happened. We can’t believe it. We go into major party mode celebrating this momentous victory and we pour our congratulations on the first devotee in ISKCON to ever sell a big book on sankirtana. Here we are, a band of six very young devotees thousands of miles from the big temples in ISKCON, and we are making history pioneering big book distribution. As we sit in the van savoring the moment, we sense we are onto something big, something that could be the beginning of a big book distribution breakthrough in ISKCON. From this time on, whenever we go out door to door we bring Krsna Books with us. And every once in a while someone takes a book and pays us $8 (this is 32 times more money than we get for selling a magazine, so that alone is pretty exciting. It’s also exciting because $8 is the normal total daily sankirtana collection for the entire temple.). Every time one of us sells a Krsna Book it is still as unbelievable and exciting as the day the first book was sold. When I sell my first Krsna Book I get so excited – actually intoxicated – that I can’t find my way back to the van to meet the other devotees. I am running wildly down the street in ecstasy because I can’t wait to tell everyone what happened. But I get lost – and the van is only two blocks away! Later I read that Prabhupada said “This book distribution is the real intoxication.” I think those of us who were the first to distribute big books got a really potent brew of this intoxicating drug called big book distribution. Although we sell a few books here and there, we don’t have a technique to sell them. So our sales are just a matter of luck, a numbers game of running into someone interested enough to buy a Krsna Book. We sense it’s possible to regularly sell big books, but we have no idea how to do it. Krsna has a plan to help us. In steps Thakura Haridas Prabhu to save the day. Thakura Haridas, a tall, enthusiastic, boisterous, in your face kind of guy from the San Francisco temple shows up one day in Vancouver. Thakur Haridas is all enthusiasm and is always making huge plans to spread Krsna consciousness. In fact, before he came to Vancouver he was in Portland teaching a professional basketball team to chant japa in order to improve their game! Thakura Haridas is looking for big challenges in Krsna’s service, so when he hears about our big book distribution he immediately buys into the idea and becomes ten times more enthusiastic than we are. It’s like his life’s mission has just been revealed to him. He is ready to take on the world with Krsna Books! Right at this time we receive an amazingly letter. 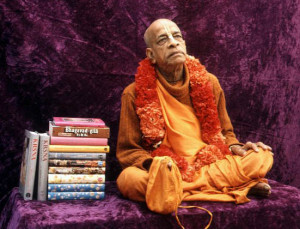 It is a newsletter about Prabhupada’s preaching and it quotes him saying, “If someone will go anywhere to spread Krsna consciousness, not considering how he will eat or where he will sleep, I will take the dust from his feet and put it on my head.” We practically faint when we hear this. This statement becomes the catalyst for a preaching revolution in our hearts. We are determined to do something to put ourselves on the line. We come up with a bold plan. We decide to load all the books and magazines we have in the temple into our van and head east into the icy Canadian winter on traveling sankirtana. We decide not to take any money with us and not to make any arrangements for accommodations. This way we will have to totally depend on Krsna and live only by preaching and distributing books. So with only a van full of books and magazines and enough gas to get us to the next town, we head out on the first ever big book distribution traveling party. We are ecstatic because we are totally depending on Krsna. We want the mercy and we know we’ll get it if we are willing go out on a limb for Krsna. It’s exciting. It’s an adventure. We are setting off to visit cities where no one has ever seen devotees or heard of Hare Krsna. (And, by the way, it is really cold for a kid like me who grew up in Southern California). We hit the road in the late afternoon. The only food we are bringing – aside from the lunch digesting in our stomachs – is some uncooked rice and dhal. But we don’t even have pots. We are living on the edge – and it’s ecstatic. We arrive in a small town about 8pm. We are used to going out on harinama wherever we go, so that’s what we do. The problem is that it’s in the middle of the winter and nobody is on the street. Well, actually there is one person on the street, the local town drunk. So here we are, three of us chanting and Haridas with his book bag full of Krsna Books, hoping that people might hear the kirtana and come over to see what’s going on. It’s too late for anyone to be around so there is no one to come over. Well, nobody except the drunk. Since he is the only person Haridas can talk to, that’s what he does. There he is showing the drunk a Krsna Book and we are looking at him thinking this is ridiculous. He’s enthusiastically talking away, showing him every single picture in the book, and we are thinking Thakura Haridas is nuts, he is wasting his time. Haridas, the drunk isn’t going to buy a book. Get real. And then we watch in amazement as the drunk shuffles through all his pockets (it took him awhile to find the pocket with the money), pulls out $8, and gives it to Haridas. No one had ever distributed big books on harinama and here Haridas sells a Krsna Book to the only person on the street – and a drunk to top it off! This event set the mood for the rest of the trip: you can distribute Krsna Books to anyone, anywhere. You just have to have a strong desire, believe you can do it, and depend on Krsna. So we’re on the street, it’s 8:30 at night and the ecstasy is slowly being overtaken by the realization that, “It’s dam cold out here, there’s no one on the street, and we don’t have a place to stay. Hmm. Maybe we should do something.” Good idea. So we drive around town looking for a place to stay and by Krsna’s grace we find a hostel. We knock on the door and we are immediately welcomed in and given our own quarters with a private bath. The place looked just like an ideal brahmacari asrama – and we had it all to ourselves. Ok, this depending on Krsna stuff really works. The next morning, upon our request, we are fed with all the fruit and nuts four hungry monks could ever want. The whole trip turns out to be a series of similar scenarios: we depend entirely on Krsna and He supplies supplies our needs. By Krsna’s arrangement we meet a devotee’s aunt and she kindly donates all the pots and utensils we need. With the veggies we collected, we are now set. We get out our hot plate, cook and have lunch. Then we spend the little money we collected on gas and head off to Calgary, the next major town on our tour. Are we surprised? Not really. We kind of expected something like this would happen. Our faith is high and it is causing amazing things to happen. Everyday Thakura Haridas manages to distribute Krsna Books while the rest of us are still trying to figure out how to do it. Haridas is becoming so enlivened by distributing Krsna Books that he can’t contain himself. It’s common that after breakfast, while we are getting ready for sankirtana, he runs out for fifteen minutes to go door to door in the neighborhood. And while we are getting ready for bed, he often does the same thing. 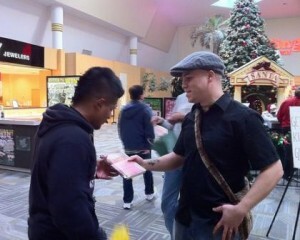 He is becoming addicted to distributing Krsna Books. And he is simply distributing books with one technique: his raw enthusiasm. One evening after a long cold day on sankirtana, we sit down for some hot milk before preparing to take rest. Thakura Haridas, unable to contain himself, runs out to go door to door. In amazement we watch him step out into the cold night while we sit comfortably sipping our milk (and thawing out from the cold day on the street). He returns about 20 minutes later. “Thakura, where did you go?” I ask. He is beaming. He tells us that he went door to door and just sold a Krsna Book to an atheist. We couldn’t believe it. Who is this Haridas Thakura Prabhu? After a week in Calgary we head east to Edmonton. Again, we ask every hippie we meet for a place for us to stay. This time we meet some hippies that are acquainted with Krsna consciousness. They have a huge house and invite us to stay with them. They encourage us to make their house our temple. So we have morning programs almost everyday (we are not used to living outside a temple so we sleep in a couple days a week) and with their help organize three incredible Sunday feasts that are each attended by about sixty people. Everyone in the house is quickly becoming attached to the devotees, kirtana and prasadam (from our stay in their house, four people eventually became devotees). Keshava proudly tells Haridas about their new traveling program of filling their van with BTG’s and not returning until every last magazine is distributed. They are totally enlivened by this program and are distributing more magazines than ever. Haridas is not impressed. He enjoys allowing Keshava to toot his horn because it will make it all the more dramatic when he breaks the news about big book distribution. So Thakura quietly listens as Keshava sings the glories of his traveling sankirtana party. Silence. Did Keshava faint? Did he commit suicide? No Keshava’s blood is boiling. He takes up the challenge. Thakura’s mission of inspiring Keshava is successful. That one call ignited a big book distribution fire in Keshava’s heart, a fire so strong that it eventually caught on all over ISKCON. I must have sensed at the time that this call was going to change book distribution forever because that event has had a lasting impression on me. To this day I still remember exactly where in the house Thakura called, what the room looked like, what he said, his mood – everything. The San Francisco temple takes Krsna Books out on their next traveling party. They end up surpassing our efforts. Keshava is now so enlivened that he calls his brother, Karandhara, in Los Angeles and tells him about the big book distribution breakthrough. Soon the fire catches on in LA with even more intensity than in San Francisco. Not only do the LA sankirtana devotees discover that they can sell Krsna Books, but temple devotees take Krsna Books to sell when shopping, doing laundry, getting gas, etc. (“I don’t have money to pay for the gas but I have this book I can give”). Devotees are becoming addicted to the intoxication of selling Krsna books. LA then spreads the news about big book distribution to the entire ISKCON world and the fire begins to slowly catch on. The above story about the first big books being distributed in Vancouver, Thakura Haridas opening up big book distribution, and his call to inspire Keshava, are important events in the history of book distribution in ISKCON, events which have not been chronicled anywhere else in ISKCON publications. (Here in the book I describe other ecstatic events, but to shorten this article and keep it focused on book distribution, I have eliminated those parts. The following paragraph begins by making reference to those events). Since so much unique and ecstatic preaching is going on, I write the devotees in Vancouver with a blow by blow account of our activities; the TV and radio shows, the Indian programs, how the house we are staying in is being transformed into a temple, and the incredible big book distribution results. The devotees are so enlivened by the letter that, unknown to us, they send it to Srila Prabhupada so he can also become enlivened by our preaching. Prabhupada loves the letter. He replies and encourages me by saying that I get the credit for starting the first traveling sankirtana party (actually Gaura Hari Prabhu, the president of the Victoria. BC temple, had already taken out the very first traveling party in ISKCON, but Srila Prabhupada had not been informed about it. Our party was the second traveling party, but it was the first to sell big books). On that trip we distribute sixty big books, the all time record for big books distributed by one temple in one month. We report the score to Prabhupada, who is no doubt pleased. In his reply us he notes how we have taken advantage of every situation to spread Krsna consciousness, and especially to distribute Krsna Books. He tells us that seizing every opportunity to spread Krsna consciousness is the symptom of an advanced devotee. I am so blessed to have taken part in this historic event and feel fortunate beyond expression that Krsna sent Haridas Thakura to Vancouver to run with my dream of distributing big books. I don’t feel that I have any qualification to practice devotional service, but perhaps having something to do with the beginnings of book distribution showered me with such mercy that I am still able to continue my practice of Krsna consciousness today.